Apple’s stock (AAPL) saw a 2.2% jump today reaching its highest since December, amid reports that its South Korean rival Samsung has suspended production of its flagship Galaxy Note 7, following reports of fires in replacement devices. Apple’s stock reached $116.59 in afternoon trading and was the largest contributor to gains on the S&P 500, while Samsung’s stock dipped by 1.5%. 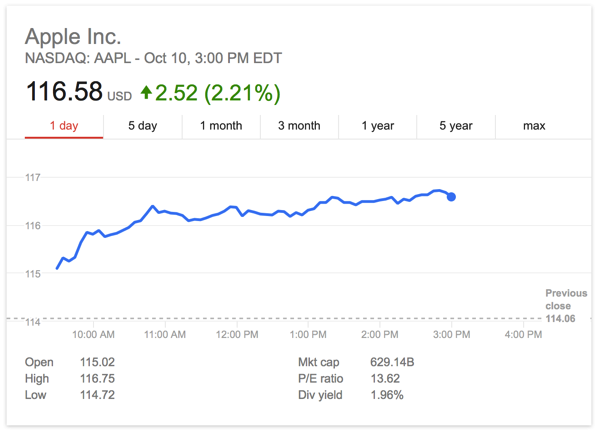 Apple stock is now trading at the same price it was last December (via Reuters). Reports of fires in replacement Galaxy Note 7 devices have proved to be a disaster for Samsung and a potential boon to Apple. The South Korean firm has failed to fix a problem that has already damaged its brand and threatened to derail a recovery in its mobile business. Verizon, AT&T and other leading wireless carriers have suspended sales and exchanges of Note 7s. 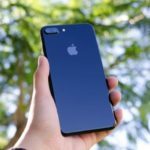 Similarly, Best Buy will no longer sell the device and said customers could return their smartphones or exchange them for a different device. “Apple’s stock has gained 13 percent since mid-September on optimism about demand for the recently launched iPhone 7. Shares are up 30 percent from lows hit in May, when fears about weak iPhone demand allowed Google parent Alphabet Inc to briefly eclipse Apple as the world’s largest company by market capitalization”. According to IDC, Samsung is still the world’s largest seller of smartphones by volume, with nearly 23% market share, followed by Apple with 12% market share.